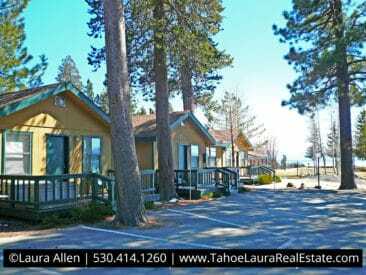 The Franciscan Condominium Development is a small-medium sized lakefront complex on the North Shore of Lake Tahoe in the Tahoe Vista, California community. 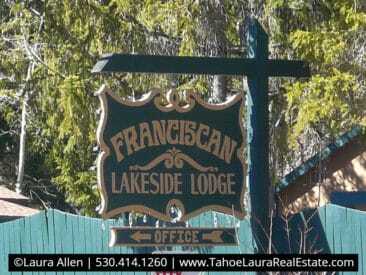 The Franciscan Lakeside condominium development has an interesting history. The complex was originally built in the 1960’s-1970’s. It was originally developed as a motel and you’ll see that in the building design. Later it was converted into a motel cooperative, and most recently the units changed their legal status into a condominium development. 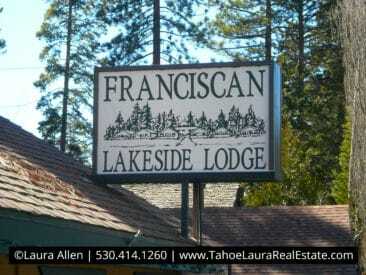 The Franciscan Lakeside Lodge has approximately sixty-three (63) units with eleven (11) lakefront units. The complex is located in three separate area with two lakefront locations and one mountain-side area. 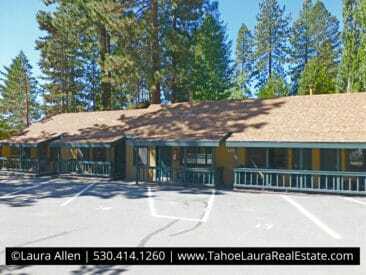 Half of the units are located on the lakeside of Highway 28 (lakefront side – two locations) and the other half of the units located on the non-lakefront area, or mountain-side of Highway 28. In real numbers this works out to be approximately thirty-three (33) lake-side units and thirty (30) units are located on the mountain-side (non-lakefront portion of the development). Most of the units in the complex are smaller, with 85% of the units being either a studio unit, or a one (1) bedroom floor plan. There are only seven (7) two bedroom floor plans, and one four (4) bedroom unit in the development. Regardless of where you unit is located at all of the lakefront and recreational amenities in the development are available to all owns. If you are considering buying a condo in The Franciscan, buyers should know there are unit usage restrictions. Full-time occupancy is not permitted, only vacation, or part-time owners, as owners are limited to using their units to fourteen (14) consecutive days at a time. The Franciscan complex has a full-time, and an on-site vacation rental desk on the property. Owners are not required to be on the vacation rental program, but if they vacation rent their unit, they need to use the on-site property manager. Some of the amenities The Franciscan Condo development offers their owners are a beautiful sandy beach area, shared pier, and buoy access. The pool is located on the non-lakefront side of the development, along with a playground area. Buoy Access | HOA has sixteen (16) buoys. See HOA rules for more information on use and access. Usage restrictions apply to all owners. Owners are restricted to only being able to use the unit 14 consecutive days in a row (zoning restriction). Owners are not allowed to occupy the units on a full-time basis. Owners do not have to be on the vacation rental program, but if you want to rent out your unit you must use the on-site program. Pets: Owners who participate in the on-site Rental Program are prohibited from having any pets in their units. Those owners that want to have a pet on-site must follow the HOA rules and are severely restricted. The Franciscan HOA can restrict reconstruction and remodeling of units. HOA Fee Includes: Water, Electrical, Gas, Sewer, Trash, Internet, Cable, Snow Removal, Insurance, Property Maintenance. Monthly HOA fees are subject to change and owners need to be prepared for annual expenses to increase. HOA Special Assessment ending March 2017 was extended and may still be in place in 2019. Actual special reserve assessment will vary by the unit size. Owners are responsible for paying their own property taxes, which are billed separately from the county.